Next stop on our trip south through the Black Hills was Crazy Horse. I must admit we didn’t really know much about the story behind the Crazy Horse sculpture before we arrived. Just as we walked into the Visitors Centre they announced that the orientation film was about to start so we went and took a seat in the theatre. We were both quite blown away by the story behind the Sculptor, Korczak Ziolkowski and his family. They have made it their lifelong mission to protect and preserve the culture, tradition and living heritage of North American Indians. After some study and many letters back and forth, Korczak accepted the invitation and work began in 1948 with only $174. Korczak’s wife Ruth (Ross) Ziolkowski (1926 – 2014) followed Korczak to the Black Hills from West Hartford, Connecticut to volunteer her assistance with the project. They were married Thanksgiving Day, 1950 and had ten children and the Memorial became a family undertaking as well as a humanitarian and educational public charity. The boys grew up helping their father on the mountain, the girls assisting their mother in the ever expanding visitor complex. Everyone helped with the dairy farm, the lumber mill and the multitude of other year-around activities at Crazy Horse, where, since 1947, the construction has never stopped. As they reached adulthood, the Ziolkowski sons and daughters demonstrated that Korczak and Ruth imparted to their family not only knowledge and skill, but also a deep love of the Crazy Horse dream. All were free to leave, but seven remained involved in the project. Realising this project would span generations, Korczak and Ruth created plans to ensure the future of Crazy Horse Memorial Foundation. When Korczak passed away, Ruth took over leadership. 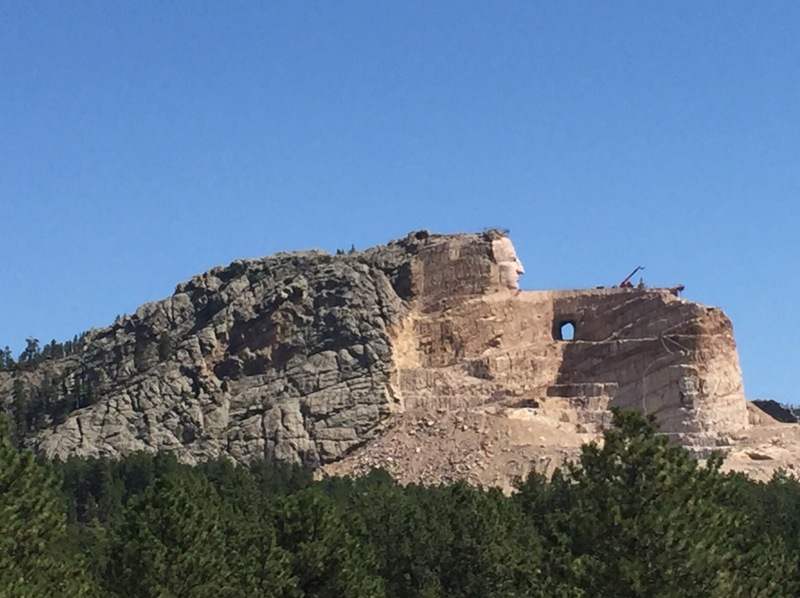 Among many feats, she shifted focus to finish Crazy Horse’s Face, enabling visitors to see the profile from the Visitor Centre. Ruth passed away in May 2014. Today, many Ziolkowski family members, dedicated staff and Board of Directors carry on the dream of the Memorial’s Founders – Cheif Henry Dtanding Bear, Korczak and Ruth Ziolkowski at Crazy Horse Memorial. 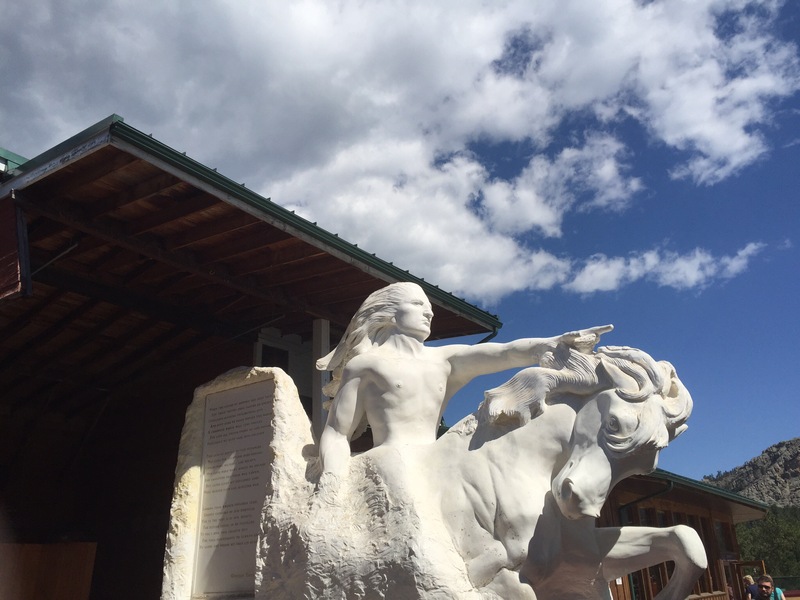 The mission of the Crazy Horse Memorial Foundation is to protect and preserve the culture, tradition and living heritage of North American Indians. The Foundation demonstrates its commitment to this endeavour by continuing the progress of the world’s largest sculptural understating by carving a memorial of Lakota Leader Crazy Horse; by providing educational and cultural programming; by acting as a repository for American Indian artefacts, arts and crafts through the Indian Museum of North America and the Native American Educational and Cultural Centre and by establishing and operating the University of North America and when practical, a medical training centre for American Indians. Crazy Horse was born as a member of the Teton Sioux tribe on Rapid Creek about 40 miles northeast of Thunderhead Mt. in the year 1843(?). He was killed at Fort Robinson by an American Indian soldier around midnight on September 5, 1877 while under a flag of truce – age 34. Not much is known of the very early years of Crazy Horse. He would have grown up with the traditional ways of the Lakota. As a very young child he would have learned things like recognizing animals & what types of plants were edible. He would have lain in the tall grass of the prairie listening to and attuning his senses to nature, hoop toss, whipping toss game and whirling bone games with his friends. He would have been taught the ways of his people from multiple sources: his father, aunts, uncles, grandmothers, grandfathers and any other member of the tribe. Learning happened every day and was always something that prepared the young man for his future life as a warrior for the tribe. A boy of 4 or 5 would have already mastered the use of tomahawks, bows and horseback riding. As with tradition Crazy Horse was not originally named Crazy Horse. He happened to start out in this world as “Curly”, aptly named this because he had wavy hair. He would be called Curly until he earned his father’s name, Tasunka Witco (Crazy Horse), by proving himself in battle. Contemporaries of Crazy Horse described him as fairer skinned than the “typical” Native American of the time, with lighter wavy hair than most. They also described his character as introspective, Crazy Horse always thought before speaking. Crazy Horse lost his mother at age 4. Raised by his father and step mothers he was again faced with great tragedy at the young age of 12 where he witnessed an attack by Lieutenant J.L. Grattan on a Brule-Oglala encampment. The altercation seems to have started as a misunderstanding while Conquering Bear negotiated with Grattan over a stolen cow from a passing homesteader. No one knows who fired the first shots but this attack on the Lakota people provided the fuel needed to create a flame of war that lasted for over 23 years. Once Crazy Horse was old enough he would have set out on one of the most important rites of passage to a Lakota warrior…the Vision Quest (Hanblecheya – which is defined as “crying for a visions “or “to pray for a spiritual experience”). This rite of passage would have given Crazy Horse guidance on his path in life. He would have gone alone into the hills for four days without food or water and cried for a dream to the great spirits. By the time Crazy Horse was in his mid-teens he was already a full-fledged warrior. His bravery and prowess in battle were well-known by the Lakota people. He rode into battle with a single eagle feather in his hair, a rock behind his ear, his body painted with white hail balls and a lightning symbol on his face. The symbols and rituals that went into preparing for war was meant to allow the warrior to draw power and protect themselves from harm during battle. In 1876 Crazy Horse led a band of Lakota warriors against Custer’s Seventh U.S. Cavalry battalion. They called this the Battle of the Little Big Horn or Custer’s Last Stand. Custer, 9 officers and 280 enlisted men all lay dead after the fighting was over. According to tribes who participated in the battle 32 Indians were killed. Although Crazy Horse is often given credit for killing General George A. Custer, there is no proof that he was the one who took Custer’s last breath. It is known that without Crazy Horse and his followers the battle’s outcome would have been much different as he was integral in stopping reinforcements from arriving. It was after the Battle of the Little Big Horn that the United States Government would send scouts to round up any Northern Plains tribes who resisted. This forced many Indian Nations to move across the country always followed by soldiers until starvation or exposure would force them to surrender. This is how Chief Joseph of the Nez Perces & Sitting Bull of the Hunkpapa Lakota were forced into submission. In 1877, under a flag of truce, Crazy Horse went to Fort Robinson. Negotiations with the U.S. Military leaders stationed at the fort broke down. Eye witnesses blame the breakdown in negotiations on the translator who incorrectly translated what Crazy Horse said. Crazy Horse was quickly escorted toward the jail. Once he realized that the commanding officers were planning on imprisoning him, he struggled and drew his knife. Little Big Man, friend and fellow warrior of Crazy Horse, tried to restrain him. As Crazy Horse continued to free himself, an Indian infantry guard made a successful lunge with a bayonet and mortally wounded the great warrior. Crazy Horse died shortly after the mortal wound was inflicted. There are different accounts putting the date of his death at either September 5, 1877 or September 6, 1877. Why was Crazy Horse was chosen by the Native Americans? Crazy Horse was born on Rapid Creek in 1843. He was killed when he was only 34 years of age, around midnight the morning of September 6, 1877. He was stabbed in the back by an American Indian soldier at Fort Robinson, Nebraska, while he was under a flag of truce. During his life he was a great leader to his people. He did not have an equal as a warrior or chief. He gave submissive allegiance to no man, White or Indian, and claimed his inalienable rights as an Indian to wander at will over the hunting grounds of his people. He never registered at any agency; never touched the pen; never signed a treaty. He wanted only peace and a way of living for his people without having to live in the whiteman’s reservations. In 1877 Crazy Horse’s wife, staying at Fort Robinson, was dying of tuberculosis. His only child, a daughter, had recently died of this same disease. Under a guarantee of safe conduct both into and out of the Fort, Crazy Horse agreed to confer with the Commanding Officers. History has proven since that the intention never was to let Crazy Horse go free, but rather to ship him to the Dry Tortugas in Florida. The chief had no notion of what was in store for him until he entered the building and saw the bars on the windows. Right then he was face to face with the fate the whiteman had intended for him. He drew a knife (the fact that he had not been disarmed is good proof that he never surrendered) and attempted to get his Indian friends outside of the stockade. Little Big Man, friend and warrior companion of Crazy Horse, hoping to avoid trouble, seized Crazy Horse’s arms. In struggling to free himself, Crazy Horse slashed Little Big Man’s wrist. At this point an infantry man of the guard made a successful lunge with a bayonet and Crazy Horse fell, mortally wounded. This entry was posted in South Dakota, USA, United States of America. Bookmark the permalink.